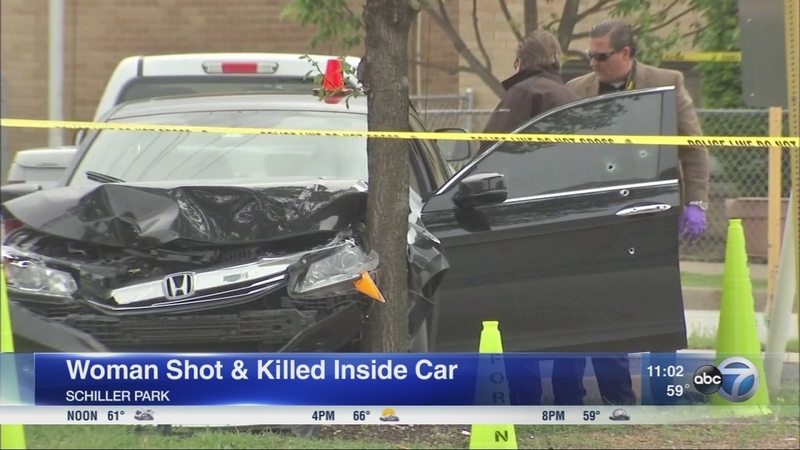 SCHILLER PARK, Ill. (WLS) -- A woman found shot to death inside a car Wednesday in west suburban Schiller Park was identified Friday. Quetcy Alma Benitez, 47, died after she was shot multiple times late Wednesday morning in the 9500-block of Lawrence Avenue, Cook County Director of Communications Frank Shuftan said. Her death was ruled a homicide. Officers found her dead inside a black Honda sedan that had crashed into a tree. There were several bullet holes in the car's window and door. A 19-year-old man was also shot in the sedan, but he survived. He was transported to a local hospital for treatment. Salvatore Calabrese, a witness, said the man ran from the Honda and pounded on a door, pleading for help. "The girl who lives right here, she heard somebody push the door and want to get in, and they left a blood print," Calabrese said. Investigators have not yet said what led to the shooting, but the cause may have been road rage. Police have not released a description of another vehicle or said whether they are looking for another driver. Anyone with information regarding the shooting should call Schiller Park police at 847-678-4794.